Kinder Morgan (NYSE: KMI) capped off a solid year by reporting $1.273 billion, or $0.56 per share, of distributable cash flow during the fourth quarter of 2018. That pushed the pipeline company's full-year results to $4.73 billion, or $2.12 per share, which, as anticipated, came in ahead of its forecast, ending just shy of the per-share record of $2.14 set in 2015. What makes Kinder Morgan's expectation-beating performance all the more noteworthy is that the company did it despite two notable headwinds. Not only did the company sell the Trans Mountain Pipeline in Canada as well as its associated income stream last year, but oil prices collapsed during the fourth quarter, which had some impact on its oil operations. 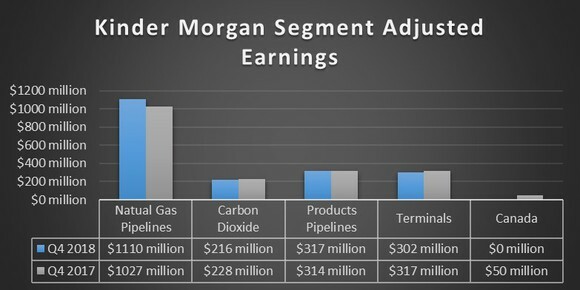 Data source: Kinder Morgan Inc. Chart by the author. Natural gas pipelines fueled the quarter. 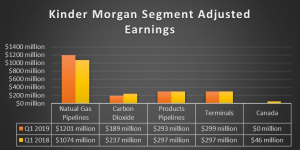 Kinder Morgan's natural gas pipeline segment finished the year strong, increasing earnings 8% versus last year's fourth quarter thanks to a 15% improvement in volumes. The company is benefiting from the growth of the Permian Basin, which drove higher revenue on the El Paso Natural Gas and Natural Gas Pipeline of America systems. Earnings in its carbon dioxide segment dipped 5% due to lower oil and natural gas liquids prices, which offset flat oil production and higher carbon dioxide prices. Terminals segment earnings also slipped 5% during the quarter due mainly to a 4% decline in contributions from the company's liquids terminals. While recently completed expansion projects increased volumes at Kinder Morgan's Houston and Edmonton hubs, higher tank lease costs following the sale of Trans Mountain impacted results, as did softness in the New York Harbor market. Earnings in the products pipelines segment rose 1% mainly due to higher volumes and revenue across three of its main systems. With Kinder Morgan Canada (TSX: KML) selling the Trans Mountain Pipeline, Kinder Morgan didn't get any contributions from its former Canada segment during the period. 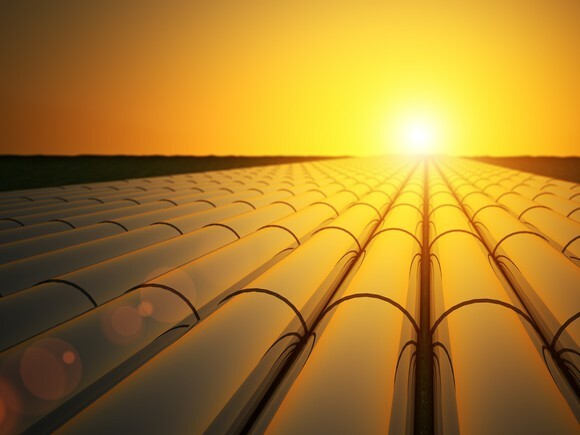 Meanwhile, Kinder Morgan Canada continues to explore options for its remaining terminal and product pipeline assets in that country, including a sale or a strategic combination with another company, or continuing to operate as a stand-alone entity. The fourth quarter capped a transformative year for KMI. In 2018, we grew our business, strengthened our balance sheet, increased our dividend, and found new opportunities to meet the growth in demand for U.S. infrastructure needed to serve domestic and global markets. Contributions from our Natural Gas segment were up substantially compared to the fourth quarter of 2017. We continued to make progress on two projects critical to the development of resources in the Permian Basin, the Gulf Coast Express and Permian Highway Pipeline projects. Our three-year campaign to strengthen KMI's balance sheet reached an important milestone as we ended 2018 with long-term and short-term debt less cash and cash equivalents of approximately $33.2 billion, and an Adjusted Net Debt-to-Adjusted EBITDA ratio of approximately 4.5 times. Consistent with that achievement, Moody's and Standard & Poor's have upgraded our credit ratings, and we are on positive outlook for an upgrade by Fitch Ratings Inc. later in the year. Kinder Morgan did an exceptional job last year. It grew cash flow at a higher rate than expected, returned more cash to shareholders than anticipated after repurchasing another $25 million in stock during the fourth quarter as well as increasing its dividend 60%, and improved its leverage ratio well beyond its five times target. Because of that, the company won credit rating upgrades from two agencies with a third likely to follow. Meanwhile, it firmed up its growth prospects by jettisoning the controversial Trans Mountain Pipeline expansion, which remains in limbo, and started replacing that lost growth by sanctioning new projects. As Kean noted, it was truly a "transformational year" for the company. Kinder Morgan expects cash flow to continue rising in 2019, with it forecasting that it will produce roughly $5 billion, or $2.20 per share, in distributable cash flow. That will provide the company with enough money to increase its dividend by another 25% in 2019 as well as most of the funds needed to finance its $3.1 billion capital budget. Matthew DiLallo owns shares of Kinder Morgan and Moody's. The Motley Fool owns shares of and recommends Kinder Morgan. The Motley Fool owns shares of Moody's. The Motley Fool has a disclosure policy.